Is everyone ready for a fun story to read? Is everyone ready for an adventure? Is everyone ready to travel the world without leaving their home? Is everyone ready to throw caution to the wind and just go out and live life? Is everyone a fan of stories like Around The World in 80 Days, Howl’s Moving Castle, Romeo and Juliet, and Treasure Island? Then it is time to pick up and read author Patrick Canning’s newest novel published by Evolved Publishing, The Colonel and The Bee. Beatrix dazzles the crowds with her amazing acrobatic skills in a traveling circus, but what the audiences don’t know is that she is abused by the ringleader and has been for years. Wanting an out and wanting to discover who she could truly be out in the world, her prayers are answered one night in Switzerland when Colonel James Bacchus shows her a kindness during one of her shows. The Colonel is known for traveling the world in The Ox, a four-story hot air balloon, and Beatrix takes her chance, fleeing from the ringleader that very night. Onboard, she discovers the Colonel is pursuing a criminal who is after The Blue Star Sphinx, a very rare and incredibly valuable figurine, and Beatrix offers her help for passage on The Ox. But catching the criminal will not prove easy as groups of dangerous treasure hunters are also in pursuit of the figurine and will do whatever it takes to get their hands on it. The race is on as the acrobat and the explorer follow clues that take them across the world, leading to an adventure Beatrix could only dream about that is as unexpected and unpredictable as the Colonel himself. What a gem of a story readers will find in The Colonel and The Bee. Canning has taken elements and ideas that readers love to find in stories, then used his incredible storytelling to mix everything together into a literary cocktail of fun. Take the aforementioned stories: anyone who loves any or all of these stories will instantly fall in love with The Colonel and The Bee. Readers who enjoyed Verne’s Around The World in 80 Days or Jones’ Howl’s Moving Castle will enjoy the unconventional means of travel the Colonel has or even the strange diversity of characters that travel together that goes very much along the lines of the circus Beatrix ran away from. Each character is different and unique, yet they come together to form a family. The adventure of finding The Blue Star Sphinx and the dangers that come with treasure hunting will please fans of Stevenson’s Treasure Island. And a nod to Shakespeare’s Romeo and Juliet makes an appearance, though not between the characters readers may think. Credit is most certainly due to Canning’s writing style for he truly captures the feel of the time period his story takes place in. Taking place sometime during the 19th century, Canning took the time and care to ensure his story sounded like it occurred during this century. From the settings to what the characters are wearing to the professions of the different characters to the weapons they use to how they speak all sound historically accurate and these elements will please fans of stories that take place in the 1800s. One of these elements stands out more than the others, for how the characters speak is most certainly to be commended. If people who lived during the 19th century heard the way we talk today, heard the way we have shortened words and phrases using text lingo and numbers, they would most likely be mortified. Even though those who lived during that time are not alive anymore, the way they used to talk can always be found in books and stories. Canning captured this way of speaking beautifully both through the characters and the narrative and, for those of us who are embarrassed by modern day speech, this proves a real treat and a breath of fresh air from today’s sheer lingual laziness. Let us not forget the two characters that make up The Colonel and The Bee’s title for they are characters readers will fall in love with. The Colonel is an adventurous soul who throws caution to the wind, sets out to finish whatever he starts, and hides more than he reveals, but always looks out for those who need help and makes them feel like they can do anything. Beatrix, even though she is young, is responsible and very mature, looks out for others and helps in any way she can, but is also hoping to one day be loved for who she is. As a pair, there is really nothing they couldn’t do. Even when things are going downhill and it seems there is no way out, Beatrix and the Colonel have such an optimistic attitude and always find a way to make things better. This is a good practice that everyone should try, especially in today’s world, instead of turning to unhealthy means of coping. And the optimism these fictional characters portray is infectious and will make others happy just by reading. As for their relationship, it is refreshing to read for they are not necessarily lovers nor are they like father and daughter. If anything, they act more like brother and sister or the best of friends. They rely on each other for strength, wisdom, courage, and friendship, making an unstoppable team. There is one word that best describes Canning’s latest work: fun. 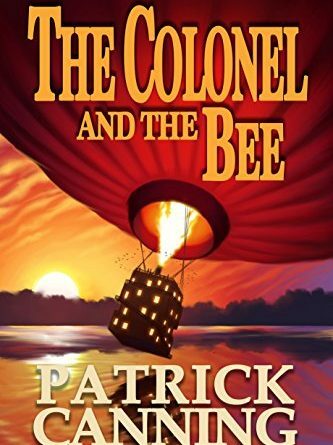 The Colonel and The Bee is that fictional gem readers have been waiting to find for a while to lose themselves in. Readers will travel around the world by a means of transportation that could never work in real life. They will become part of a treasure hunt that has danger, fear, excitement, and laughter. They will become part of an adventure with characters who have infectious optimism and undefeatable spirits. It is a story that will capture the attention of a large audience of readers, peaking the interest and curiosity with fan favorite elements found in other popular works of fiction. Anyone who begins The Colonel and The Bee is guaranteed an excellent new read they will not want to have end.